Editor’s Note: This feature originally appeared in the July issue of DS News, out now. The Legal League 100, a professional association of financial services law firms with member law firms spanning nearly all 50 states, recently gathered at the historic Joule Hotel in Dallas, Texas for their 11th Spring Servicer Summit. A leading force for industry standards, market research, and policy change, the League is committed to supporting the mortgage servicing industry through education, communication, relationship development, and advisory services. In addition to a full day of education and communication between attorneys, servicers, and government representatives, the Summit also saw the announcement of the League’s most recent leadership elections. The group announced that Roy Diaz, Shareholder, SHD Legal Group P.A., had been elected Chair of the Legal League 100. A member of the Florida Bar since 1988, Diaz has concentrated his practice in the areas of real estate, litigation, and bankruptcy. He has represented lenders, servicers of both conventional and GSE loans, private investors, and real estate developers throughout his career, with an emphasis on the mortgage servicing industry for over 22 years. 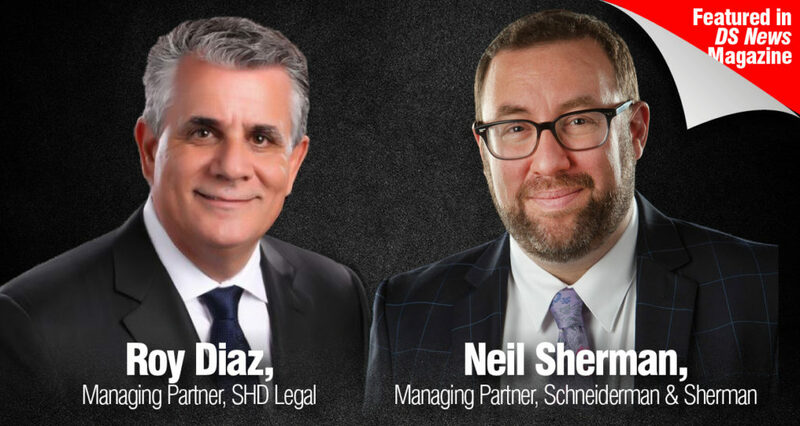 Diaz, who previously served on the Legal League 100’s Advisory Council, took over the position from departing Chair Neil Sherman, Managing Partner, Schneiderman & Sherman, who served as Legal League 100 Chair from May 2016. Sherman will continue serving as a member of the Advisory Council. In the midst of the Servicer Summit, both Diaz and Sherman took some time to sit down with DS News and reflect on where the League has been, where it’s going, and what it means to the both of them. As for Sherman, he said he believed servicers and financial services firms need to keep their eyes on the future—and on the technology that will take us there. “If you’re not learning about the fintech side of our industry and contemplating how that will adjust the way we do business, you’ll likely be left behind,” Sherman said. The Legal League 100 will assemble again for their Fall Servicer Summit during the annual Five Star Conference, happening this September 16-18 at the Hyatt Regency in Dallas. Best Homes Title, Now in Plymouth! https://besthomestitle.com/wp-content/uploads/2019/03/Header-Logo-Horizontal-300x140.png 0 0 Best Homes Title https://besthomestitle.com/wp-content/uploads/2019/03/Header-Logo-Horizontal-300x140.png Best Homes Title2017-10-17 08:40:592017-10-17 08:40:59Best Homes Title, Now in Plymouth! Criminals begin the wire fraud process way before the attempted theft occurs. Most often, they begin with a common social engineering technique called phishing. This can take the form of email messages, website forms or phone calls to fraudulently obtain private information. Through seemingly innocuous communication, criminals trick users into inputting their information or clicking a link that allows hackers to steal login and password information. Best Homes Title Agency LLC is a full-service title company offering a wide range of residential and commercial title and escrow services. Established in 2006 with four title professionals, Best Homes Title, headquartered in Farmington Hills, has ballooned to 70 employees and 13 offices covering the entire State of Michigan. We’re proud of our growth as we approach our first decade in business. It is our goal to be an industry leader in the title and settlement services sector, from the tip of the Upper Peninsula to the state’s southern borders, through the marriage of “old school” customer service and cutting-edge technology. Our team represents the very best of what our industry has to offer: experience, creativity, expedience, and simply the best customer service. At Best Homes Title and its Commercial Division, BHT Commercial, we put our clients first while standing at the forefront of industry compliance. Best Homes regularly provides continuing education to the mortgage and realtor communities. Along with our partner, Martindale Hubbell, AV-rated attorney, Peter Schneiderman, Neil Sherman has received a number of recent local and national honors. In 2014, he was named to DBusiness magazine’s “30 in their 30s,” as well as being recognized nationally by HousingWire magazine as a 2014 Real Estate Rising Star. FARMINGTON HILLS, Mich. (June 1, 2015) – In its effort to become one of Michigan’s largest and most experienced title- and escrow-services company, Best Homes Title announced today that it has grown with its acquisition of Rochester Hills-based Homeowners Title Agency. This is the company’s largest Metro Detroit expansion, boosting Best Homes Title to 13 full-service offices across the state. Best Homes Title now has more than 75 employees, including an array of industry veterans in the areas of residential and commercial real estate. Through the years people have sought economical ways of streamlining succession plans of owning real estate and avoiding the prospect of probate court upon the owner’s demise. Often this resulted in a parent or parents deeding property to themselves and their heirs or desired successors, as joint tenants with rights of survivorship. In many cases that achieved the desired goal, passing title to the designated survivor(s) and voiding the time and expense involved with probating an estate. But such a practice was not without potential issues or problems. What if: (1) the grantor changed his or her mind as to who should get (or share) the real estate after his or her death? Of course, there could be numerous factors that might change the relationships or appropriate nature of the grantees. Perhaps one of the heirs (grantees) moved across the country and thus had no need or interests in the real estate. What if one of the heirs had been the principal care giver in recent years and was deserving of a greater share? Or what if there was a falling out between the grantor and one of the heirs? How could the grantor change his or her mind and undo what had been previously put in place? When it comes to retail and residential title and closings, we understand the customer service that is needed to keep production at its best and clients’ expectations met and exceeded. One of the things that we pride ourselves on at Best Homes Title is that, since we have opened in 2006, our escrow department has continued to grow in all aspects, including REO, Retail, Commercial, and REFI business, which includes an exceptional support staff. We pride ourselves on the hands-on approach from the time a file comes in until it is complete. This hands-on approach means having one main contact on our retail files, which we have found to be very important to our local clients. In addition, our office is very flexible and will send a closer out to ANY location requested by the local client to help accommodate our clients on any Purchase, REO, Commercial, REFI, FISBO and Retail Cash Deals. Office Hours 8 a.m. – 6 p.m.